When it comes to pizza, I’m a red sauce girl. #redsaucegirl. It’s an official term. What does it mean, you ask? Well it just means that in almost every situation where pizza is involved, I prefer those combinations with red sauce over any other. So, why am I posting about a pizza with *gasp* sweet potato sauce?!?! Because it is a damn fine pizza (I’m channeling my inner Special Agent Dale Cooper here). And even though I grew up in the tri-state area and loved New York style pizza for many, many years, I’ve come to appreciate all pizza. From all walks of life. From any coast. I will try it if you call it pizza. 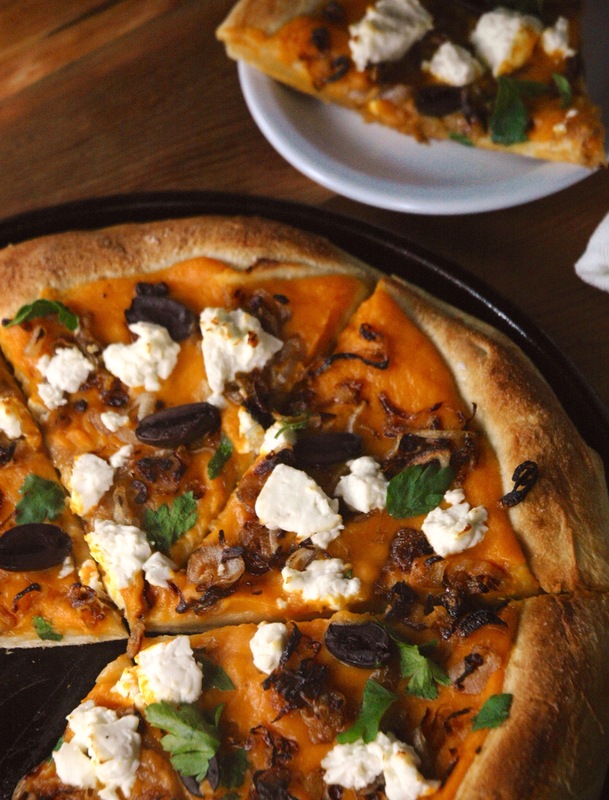 This pizza is great because the sweet potato sauce is rich and slightly sweet and when it’s mixed with sharp feta and salty kalamata olives – oh my! And then there are the flavor-packed caramelized onions, bringing a smoky sweetness to the party. Okay, friends. Go forth and cook this pizza. It will not disappoint. 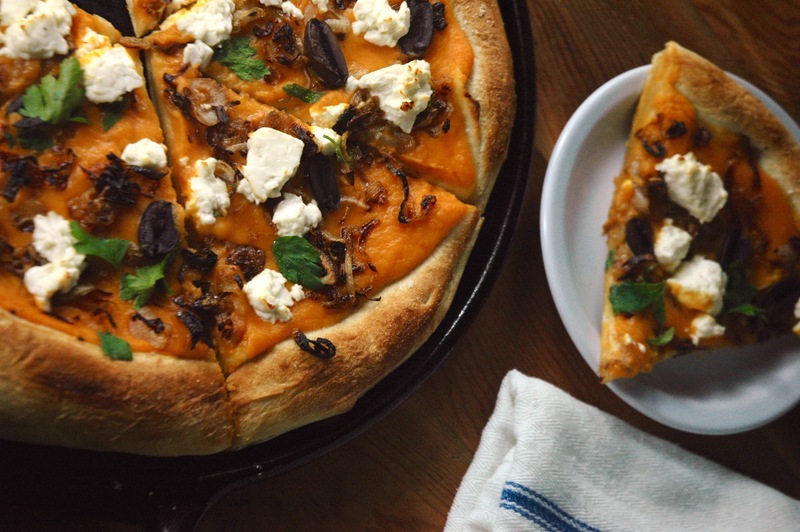 Tip: I used my Lodge cast iron pizza stone to bake this (which works like a charm! ), but a regular baking sheet will do just fine. Oven temps and cook times will vary, so adjust as necessary. Peel sweet potato, onion, shallots and garlic cloves. Chop sweet potato into 1/2 inch chunks. Chop onion into medium dice. Mince garlic cloves. Thinly slice shallots. Let pizza dough rest, covered, in a large bowl. In a small (cast iron) skillet, heat 1 tbsp olive oil over medium-high heat. Once hot, add shallots and sauté until soft. Season with salt and pepper. Turn heat down to medium-low and cook, stirring occasionally, until browned (30-45 mins). Meanwhile, heat 1 tbsp olive oil in a medium saucepan over medium heat. Once hot, add the onions. Cook until soft and translucent (5-10 mins). Add in the garlic and sweet potato and cook until fragrant (1 min). Add bay leaf and enough water to the pan to just barely cover the veggies. Bring to a boil, then turn down heat to low and let simmer until veggies are tender (15 mins). Remove bay leaf. Use an immersion blender to blend vegetables. Season with salt and pepper to taste. Put pot back onto heat and simmer, on low, until thick (15 mins). Partially cook the pizza dough on a preheated pizza stone or baking sheet. Assemble pizza by layering sweet potato sauce on the bottom. Sprinkle caramelized shallots, Kalamata olives and feta evenly on the pizza. Bake until crust is golden brown and toppings are bubbling. Finish pizza with fresh parsley, grated parmesan cheese and red pepper flakes to taste. Know your dough. Experiment with the dough you can find at your local grocery store, or even easier, buy a pre-made crust. Just make sure to precook the dough slightly before adding all your delicious toppings!